It seems unbelievable to me that Strawbs' 40th Anniversary Celebration was over a year ago now, and I'd just like to say for the record how superb I think Vol. 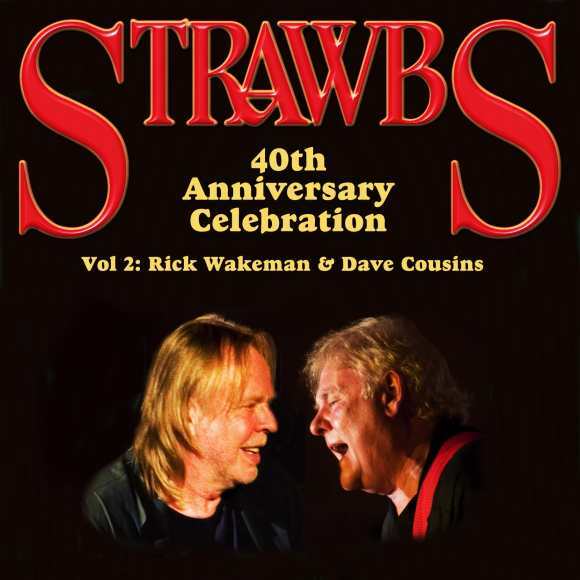 2 of the Strawbs 40th Anniversary Celebration (Rick Wakeman and Dave Cousins) is. Inevitably, after a day spent revelling in watching past and present members of Strawbs take the stage in a variety of line-ups and playing an eclectic mix of music, The Live Room at Twickenham Rugby Stadium on Saturday 12th September 2009 was palpable with the anticipation of fans and music-lovers from far and wide as Dave and Rick took the stage. While Volume 1 (entitled Strawberry Fayre) beautifully captures the flavour of the other acts and Strawbs' line-ups which played that weekend, Vol. 2 is dedicated to the Saturday finale, and provides a veritable feast for fans of both Rick Wakeman's awe-inspiring playing and Dave Cousins' masterpieces, mainly from Strawbs' albums recording during Rick's time as a Strawb, i.e. Antiques and Curios and From The Witchwood. Having for some reason acquired a glut of new CDs and DVDs to listen to and watch around the time of Vol. 2's release in late 2010, I decided to wait to open my copy until Christmas so I would have more time to fully appreciate the contents (I was subconsciously reliving the anticipation felt at Twickenham, obviously). I am absolutely delighted with the package; it was straight in with the DVD and I feel it captures the essence of the evening so masterfully. I really had not had time to read up on what exactly was contained in the 2-disc set before opening it, and think the way the camera-work has captured the warmth and camaraderie between Dave and Rick is quite amazing. Not only did their set provide musicianship of the highest calibre, but as those who were there couldn't possibly fail to have noticed, the two of them were frequently in such fits of laughter at each other's stories they could hardly begin to play! They somehow (thankfully!) managed to switch between riotous merriment and mirth to performing songs (including "The Hangman And The Papist") with the dignity they deserve. I love the terrific camera shots of Rick's hands gliding up and down the keys as they are mirrored in the reflection of the piano. And there's more...the DVD not only captures the intuitive understanding and warmth between Rick and Dave in their roles as raconteurs/comics, and, of course, as outstanding musicians as they come together to play several of Dave Cousins' classic songs, it also includes bonus features of them talking about the experience of working alongside each other. Clearly they both consider theirs to be something of a "special" relationship. Heartwarming stuff. The other bonus feature which, for me, is truly magical to watch is of Strawbs, along with members of The Royal Artillery Band, playing "Evergreen". Again, the atmosphere of the occasion oozes from this DVD with some terrific camera shots. It must have been very difficult to film I would have thought with so many things going on all at once, but Jon Connolly and his team have done an excellent job making it wonderful to relive for those who of us lucky enough to be there, and equally wonderful for those who weren't there to have the chance to experience the magic. The Orchestra was conducted on that evening by Robert Kirby, another master-of-his-trades (and also once a Strawbs keyboard player) with an immense zest for living life to the full. It is so sad that he is no longer around and will not have the chance to watch this DVD or listen to the CD. I am so glad he contributed to the weekend however, as it was the first time many Strawbs' fans had ever met or even seen him, and mingling after the show allowed everyone to experience first-hand his inclusive and friendly nature. On a similarly sad note, Fred Wedlock, who compered the weekend and, as ever, had tears rolling down people's faces with his funny songs and stories, is no longer around. He seemed to have the ability to see humour in just about anything and everything and will be sadly missed. I'd seen him support Strawbs on a few occasions prior to the Twickenham weekend and he was invariably friendly and good-natured to anyone and everyone in his path. As with Robert, although it is bitter-sweet to watch him on this DVD I for one am so glad his contribution was captured for posterity. So, the DVD is very definitely a hit for me, and the accompanying CD of the songs is currently gracing my car CD player. It is so relaxing to listen to it even makes me wish for more traffic jams. (Ok, maybe that's going a bit far). That's about it, just remains to say that I think the sound is superb. Seeing as the recording was by Paul Smith and mixing and mastering by Chas Cronk that's only to be expected. I do seem to have a glitch on the song-titles on the CD for some reason, as I get "October to May" listed twice when in fact one of the tracks is "Witchwood", and my other little moan is "Temperament of Mind" being changed to "Temperance of Mind", but I don't want to turn into a grumpy old man (or woman!) or start a Monty Python "dirty fork" sketch. Overall I think the package is absolutely terrific, with a lovely eight-page booklet of fascinating photos of Rick and Dave and a couple of interesting little biogs. Well worth waiting for, this is an historic package which any Rick Wakeman and/or Dave Cousins fan ought to have in their collection.